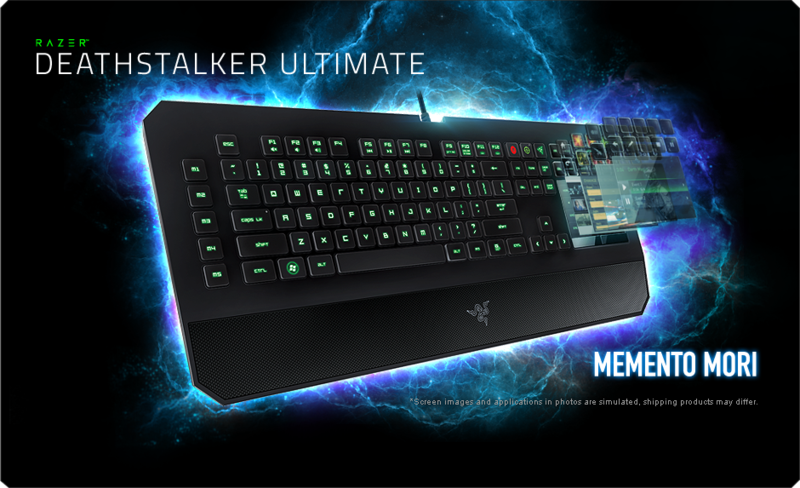 Razer DeathStalker Ultimate T1 Memento Mori! Razer Synapse 2.0 is cutting-edge, intuitive software that functions as the Razer DeathStalker Ultimate’s brain, automatically syncing the gaming keyboard to a cloud server to download driver and firmware updates, while saving your individual settings. Sync your custom settings and macros automatically with this unified configurator, allowing customization of all your Razer products with a single login. Keep track of how long you’ve spent in-game using the Clock app. Use the Stopwatch utility to time how long it takes you to collect 9 wild boar hides and kill 10 dungeon rats. Tired of throwing a game just because you accidentally hit the Windows key? The Gaming Mode app disables the Windows key by default when toggled on. You can also choose to disable the Alt-Tab and Alt-F4 commands, so you’ll never have to worry about hitting the wrong keys in the midst of pwning again. The Numpad app transforms the Switchblade UI into a fully functional digital number pad. Punching figures into Excel was never this cool. Gain quick access to all of your favorite songs with the Media Player Application on Razer’s Switchblade User Interface. Listen to all of your favorite songs, create, edit, delete your playlists on-the-fly, and while waiting to respawn, view your favorite videos right from the Switchblade User Interface. With the Media Player App, alt-tabbing out of your game to locate your favorite songs will be a thing of the past. Go into battle fully prepared with the Battlefield 3 app. Quick-switch between weapons, access equipment, and use context-sensitive controls to attain victory with ease. Go, go, go with the Counter-Strike: Global Offensive app. Re/auto buy weapons with a single touch, swap weapons, and even defuse bombs with the intuitively mapped custom controls available on the dynamic, adaptive tactile keys. Capture the flag, move the payload and back-stab snipers with the Team Fortress 2 app. It is custom-designed to support all classes with their own specific abilities all easily accessible from the dynamic adaptive tactile keys. Slay mighty dragons and explore the continent of Tamriel with the Skyrim trackpad application that provides users quick and easy access to vital commands such as map, perks menu, journal, dragonborn, character menu and many more. Fus-ro-dah to victory. What is the Switchblade User Interface, and what does it do? 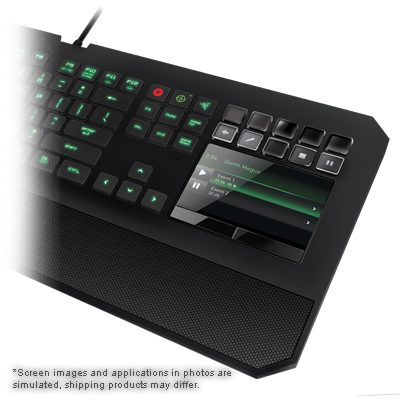 The Razer Switchblade UI is what you see on the right side of the Razer DeathStalker gaming keyboard. This includes the 10 Dynamic Adaptive Tactile Keys, and the Multi-Touch LCD Track Panel below. The Razer Switchblade UI is an all-new innovative user interface designed from the ground up to make your gaming experience more efficient, intuitive and exciting. You can bind an infinite number of commands, skills and macros to the 10 Dynamic Adaptive Tactile Keys, both with user created icons and custom icons from selected games included with Synapse 2.0! The Razer Switchblade UI is fully customizable for users who prefer to define their own keysets and macros. The revolutionary Multi-Touch LCD Track Panel is capable of two modes: one mode allows display of information (such as a web browser, YouTube, etc) in full vibrant color, while the other functions as an ultra-sensitive, multi-touch panel. The image on the Switchblade UI tactile keys appears blurry when looking at it directly from the top. The Switchblade UI tactile keys were engineered to project images from an LCD, which sits below the surface, at a directional angle to the user that is optimized when the user is seated and facing the front of their monitor. What are the Apps available on the Switchblade UI? The Razer DeathStalker will ship with 6 new apps – the Game Timer, Screenshot and Star Wars™: The Old Republic Combat Logger, Counter-Strike trackpad, Battlefield 3 trackpad, Team Fortress 2 trackpad applications These apps come in addition to the original 10 apps available previously on other Switchblade UI enabled devices. We are working with game developers to produce more game specific apps. These apps will feature commands and artwork optimized to work with these individual games for an immersive experience, and will be available in the near future. You can learn more about the apps HERE. Does the Razer DeathStalker gaming keyboard have anti-ghosting technology? Yes! The Razer DeathStalker gaming keyboard features extreme anti-ghosting technology across its keyset that allows up to 10 simultaneous key presses. Is the wrist rest on the Razer DeathStalker gaming keyboard removable? No. The wrist rest on the Razer DeathStalker gaming keyboard is fixed to the keyboard at an ergonomically optimized angle, ensuring hours upon hours of comfortable gaming. Can I customize the multi-color LED lighting on the keyboard? Yes, you can. You can customize the multi-color LED lighting that runs through all the keys on the keyboard. Synapse 2.0 is a groundbreaking application that instantly stores your custom settings and Razer add-ons online in the cloud and lets you retrieve them at will from any location. It completely eliminates the painstaking reconfiguration process and lets you spend more time dominating the competition. New PC? No problem. Trip to the LAN center? One sync and you´re ready to go. Find out more over HERE. What are the requirements for the Switchblade User Interface? Requirements for the Switchblade UI includes, Windows Vista, Windows 7 or Windows 8, Internet Explorer 9 or 10, Adobe flash player, and Synapse 2.0 all to be installed. For other enquiries or troubleshooting, please contact Razer Support at www.razersupport.com/email.